Huge protests have erupted across Turkey, as Berkin Elvan, a 14-year-old boy wounded by police during the Occupy Gezi protests last year, has died. Clashes with police have occurred across the country and many workers are due to strike tomorrow in protest. One libcom poster reports from the streets. Berkin Elvan, a boy who was shot by the police in the head with tear gas when he was 14 years old, died today, 269 days later, at the age of 15. Berkin had left his house to buy bread when he was shot by the police. Demonstrations have been occuring in all major Turkish cities today, some of them are sponteneous and some organized by the bourgeois left. Students in lots of universities, apparently in quite massive numbers are walking out off classes as are high school students in several cities. DISK, the leftist private sector trade-union, has declared that it will go on a strike tomorrow midday which, I expect, will be a half-a-day show thing. I will try to give further updates on the situation. Survived the day. I had missed tear gas. Ankara seems lost for now though the demonstrations in Ankara universities were apparently incredible, as big as it has ever been in possibly all universities, students sponteneously walking out. Students from most universities joined the central demo in Kizilay except the METU students, who tried to march from their university to Kizilay, were blocked by the cops, engaged in a battle with the police yet couldn't pass. The central demo was attacked with an unprecedented brutality, even compared to the Gezi days. They tore all the pictures of or about Berkin they could lay hands on, the boy their fellows murdered in Istanbul. Demonstrators regrouped and were joined by those coming from work in numerous parts of the city yet most of these are as far as I know over. 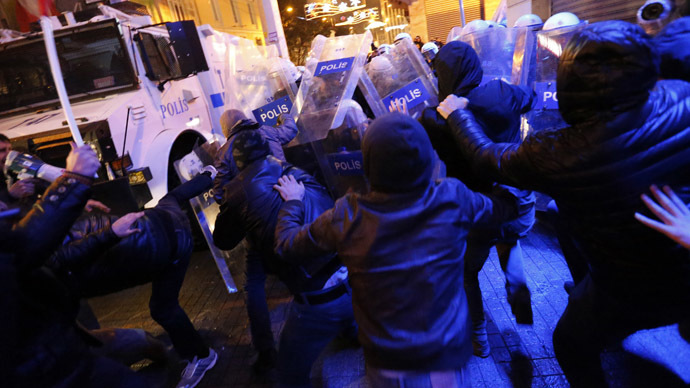 The police is using more advanced tactics compared to Gezi, such as chasing demonstrators to the neighborhoods they escaped into and throwing cans of tear gas into those neighborhoods. Istanbul still stands, however. In some neighborhoods thousands demonstrated and in others the number was tens of thousands. Some of these demonstrations are still going on, there are clashes with the police in several parts of the city. There are demonstrators who are still trying to get into Taksim square. Throughout the day, there were massive demonstrations in many cities around the country, the ones in Eskisehir, Adana, Mersin, Izmir, Antakya, Canakkale and Dersim being incredibly massive. There were wide-spread clashes in many of these cities as well. Also, there were reasonably large demonstrations in Kurdish cities such as Diyarbakir and Batman where there hadn't been demonstrations before, and there were massive demonstrations in certain cities like Erzincan and Trabzon which weren't very active during Gezi and the first of which was a tradition AKP power-house. All in all, the demonstrations, while not as massive as Gezi had been at its most massive moment yet in Istanbul and Ankara, are certainly on the same level with the general average of the Gezi days which, if this lasts, is a promising beginning. Erdogan, feeling at his most vulnarable due to the mountains of tapes about his corrupt practices which had been published online and the mountains to be published before the local elections of the coming month, has been getting increasingly aggressive and violent, threathening to ban facebook and youtube after the elections and passing laws for tighter internet control and laws giving the Turkish Central Intelligence Agency much greater powers. The policemen attacking the demonstrators seem to reflect his mood, taking their orders from a wounded and cornered beast who, naturally, is at his most dangerous. Already, there's been demonstrators who were heavily injured by the police. On a personal level, what amazed me the most was how the sorrow and indignation about the death of this young boy was shared by so many people, how a mood of mourning was dominant everywhere today, how so many people started their day with tears upon hearing the death of a boy who they did not know, and how they came out in numbers so massive it doubled, perhaps tripled every demonstration since Gezi. Many demonstrations had been organized in the recent months about varied subjects such as the internet ban, corruption etc. yet many were wary of their demonstrations could be used by the Gulenist cult or the opposition parties so they hadn't come out. When Berkin died, they did.